From the ancient Vedic scriptures of India comes the famous epic of Prince Prahlad.In a previous era – long, long ago – there was an evil monarch named Hiranya-kashipu, who succeeded in seizing control of the entire universe. He was extremely cruel, and due to his darkened heart he made life impossible for everyone – from animals to demigods. Only his son Prahlad, who was always absorbed in meditating on the Lord, remained undisturbed by his father’s reign of terror. Seeing the boy’s natural predilection for spiritual life, and thus taking him as an archenemy, he tried to kill his own child, but was unsuccessful every time. 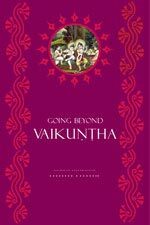 This exceptional book is a compilation of five different essays which Srila Gurudeva has written over the past 20 years in defense of Gaudiya sampradaya tattva siddhanta. Each refutation is elaborately and conclusively proven with evidence from sastra. Included in this edition are two lectures by Srila Gurudeva which glorify and follow the example of Srila Bhaktisiddhanta Sarasvati Gosvami Prabhupada who boldly re-established the true conceptions of Sriman Mahaprabhu and the gosvamis, and began the preaching mission which is today bringing this pure bhakti tattva siddhanta to every country in the world. An unprecedented collection of devotional songs Sanskrit, Bengali and Hindi devotional poems, prayers, songs and bhajanas written by the Gaudiya Vaisnava acaryas and compiled for the practicing devotee. This treatise was originally written in Bengali, in the year 1986, for the 500th anniverary of the advent of Sri Caitanya Mahaprabhu, the scheduled yet hidden incarnation for this age of Kali, as established in Sriman-Bhagavatam and other Veditc litaeratures. It was composed by Sri Srimand Bhaktivedanta Narayana Gosvami Maharaja (Srila Gurudeva), Sri Caitanya Mahprabhu’s illustrious personal associate, whose sole misson and most prominent speciality (vaisistya) is to give clairty and emphasis to the specific, internal nature of Sri Caitanya Mahaprabhu’s all-compassionate mission in this world. These translated lectures comprise the immaculate commentary of Srila Bhaktivedanta Narayana Maharaja on Srila Sanatana Gosvamipada’s Sri Brhad-bhagavatamrta. Descriptions given tell how, having recently arrived in Sri Vaikuntha-dhama, the most desirable of places and which entrance into is sought after by unlimited saintly persons, Gopa-kumar is feeling despondent and cannot even ascertain the cause of his own dissatisfaction. At that time he is approached by Sri Narada Rsi, who becomes his siksa-guru (instructing spiritual master) and enlightens him with the tattva necessary to complete his spiritual journey and thereby attain the fulfilment of all his long cherished internal desires â€” the transcendental land of spontaneous loving devotion to Sri Sri Radha-Govinda, Sri Goloka-Vraja. 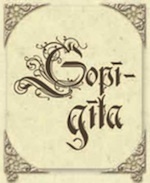 Gopi-gita is part of rasa-panca-adhyayi, the five chapters of Srimad-Bhagavatam that relate rasa-lila. The body has five kinds of life-airs (panca-prana) residing in the heart, and among these five, one is most vital. The twelve cantos of Srimad-Bhagavatam are likened to twelve parts of a body. The tenth canto is the heart of that body. Within that heart, the five chapters that constitute rasa-panca-adhyayi are its five life-airs, and among them, Gopi-gita is the foremost. Accepting Sri Guru as One’s Life and Soul Srila Bhaktivedanta Narayana Maharaja speaks on the importance of accepting a bona fide guru, who is more dear than life itself, the absolute necessity of second initiation, and other topics of guru-tattva. Hari-katha is the life-giving elixir for anyone on the path of devotion. This book is a compilation of sweet Hari-katha given by Srila Narayana Maharaja in the Kesavaji Gaudiya Matha in Mathura. 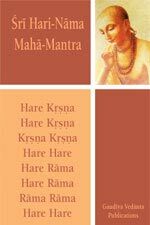 The second volume of Hari-katha, translated from the Hindi and Bengali lectures of Srila Narayana Maharaja, is another exquisite selection of lectures filled with the deep siddhanta of Gaudiya Vaisnavism. Harmony is a compilation of excerpts from the discources by our beloved Gurudeva, Sri Srimad Bhaktivedanta Narayana Gosvami Maharaja. His purpose was to give us tools and keys to create an ideal society in which everyone is happy, as well as to inspire in us a longing to achive the ultimate goal of our lives. The groundbreaking spiritual novel by Srila Bhaktivinoda Thakura Jaiva-dharma reveals the ultimate development of the path of pure devotion to the English-speaking world.